Each year, approximately 3 million people— many under age 5— swallow or have contact with a poisonous substance. The American Academy of Pediatrics (AAP) offers tips to prevent and to treat exposures to poison. 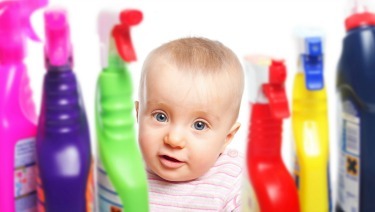 Store medicine, cleaning and laundry products, (including detergent packets) paints/varnishes and pesticides in their original packaging in locked cabinets or containers, out of sight and reach of children. It is best to use traditional liquid or powder laundry detergents instead of detergent packets until all children who live in or visit your home are at least 6 years old. Safety latches that automatically lock when you close a cabinet door can help to keep children away from dangerous products, but there is always a chance the device will malfunction or the child will defeat it. The safest place to store poisonous products is somewhere a child can't see or reach or see. Purchase and keep all medicines in containers with safety caps. Discard unused medication. Note that safety caps are designed to be child resistant but are not fully child proof. Check the label each time you give a child medicine to ensure proper dosage. For liquid medicines, use the dosing device that came with the medicine. Never use a kitchen spoon. Watch the video, The Healthy Children Show: Giving Liquid Medicine Safely, for more information. If you use an e-cigarette, keep the liquid nicotine refills locked up out of children's reach and only buy refills that use child-resistant packaging. A small amount of liquid nicotine spilled on the skin or swallowed can be fatal to a child. See Liquid Nicotine Used in E-Cigarettes Can Kill Children. Keep natural gas-powered appliances, furnaces, and coal, wood or kerosene stoves in safe working order. Know the names of all plants in your home and yard. If you have young children or pets, consider removing those that are poisonous. Different types and methods of poisoning require different, immediate treatment. Swallowed poison. Take the item away from the child, and have the child spit out any remaining substance. Do not make your child vomit. Do not use syrup of ipecac. Swallowed battery. If your child has swallowed a button-cell battery or a battery is lodged in his or her nose, ear, or throat, seek treatment in a hospital emergency department immediately. Serious tissue damage can occur in as little as 2 hours. Skin poison. Remove the child’s clothes and rinse the skin with lukewarm water for at least 15 minutes. Eye poison. Flush the child’s eye by holding the eyelid open and pouring a steady stream of room temperature water into the inner corner for 15 minutes. Poisonous fumes. Take the child outside or into fresh air immediately. If the child has stopped breathing, start cardiopulmonary resuscitation (CPR) and do not stop until the child breathes on his or her own, or until someone can take over.